The grammar has three primary purposes. First, it may serve as a practical handbook, presenting the essential linguistic facts of contemporary Bulgarian to the foreign language learner who seeks to deepen his understanding of Bulgarian beyond the bare bones of the language textbook and classroom. Second, it is a comprehensive reference grammar, providing information about the structure of synchronic Bulgarian in a concise and readily usable form (the only prerequisites are the ability to read the Cyrillic alphabet and familiarity with basic linguistic terminology and concepts) which is nonetheless sufficiently detailed to be descriptively adequate. Third, it reflects the fruits of the author's lifetime of research into the structure of contemporary Bulgarian, providing original and linguistically acute observations which far transcend the typical mechanical survey of all the grammar typically provided in reference grammars. Moreover, the exposition is enriched with authentic examples taken from real, present-day language, both spoken usage and written prose (many examples are extracted from the author's collection of spoken and printed text corpora). The examples are fully translated in parallel English, and they provide the learner with a constant stream of interesting and accessible Bulgarian text to deepen his/her practical knowledge. As a result, the book is a must read for everyone from intermediate language learners to experienced researchers in Bulgarian linguistics. It would be an unsurpassed textbook for a course in the structure of Bulgarian. The grammar covers phonetics, morphology, and syntax in detail, and weaves in extensive discussion of semantics and usage. Special attention is devoted to the complex Bulgarian system of tenses, moods, and aspect. Here especially the reader will find penetrating, yet intuitively accessible presentations of classic problems in the morphology and syntax of Bulgarian. The exposition is supported by easy-to-read diagrams and tables in which the basic paradigmatic facts are presented in a form which gives the learner a very convenient reference tool. The book contains an index of terms and a selected index of Bulgarian words. 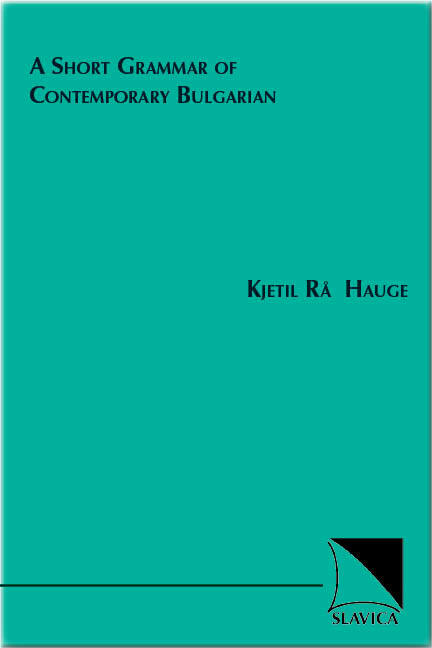 Kjetil Rå Hauge is Senior Lecturer of Bulgarian at the University of Oslo, where he has taught Bulgarian language and linguistics since the late 1970s. His previous published work on Bulgarian grammar includes "The Word Order of Predicate Clitics in Bulgarian" (Meddelelser, Nr. 10, University of Oslo, 1976), one of the first major efforts to apply the methodology of modern generative syntax to the analysis of the Bulgarian clitic system, and which influenced an entire generation of South Slavic syntacticians.